After a continental breakfast at the hotel the next morning, we were ushered to the airport's domestic terminal for our flight to Cusco. The airport was easy to navigate, security was fast, and there were announcements and attendants speaking in English given so many tourists take the domestic flights from Lima. 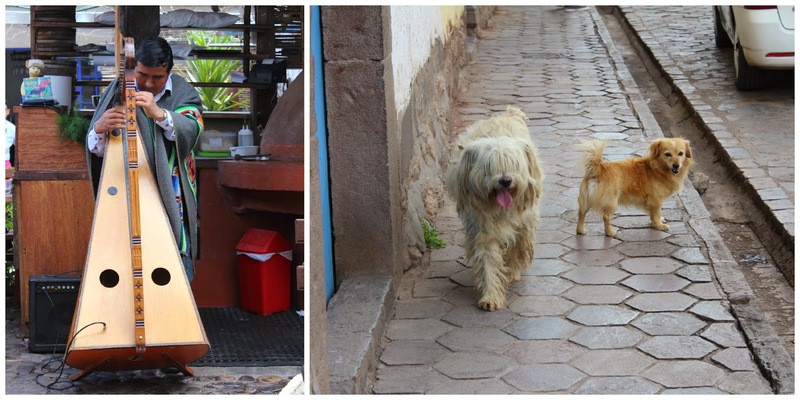 At the airport in Cusco, we met our awesome drive, Fausto, and Edgar from Kuoda who took us into the city for a delicious lunch at Pachapapa in the San Blas neighborhood. After lunch, we were introduced to our guide for the week, Jimmy. Since we were visiting during Holy Week, we were taken to tour the Qorikancha because it would be crowded later in the week. The Qorikancha, also know as the Convento de Santo Domingo. It was the site of the Inca Empire's most important temple, until the Spanish conquest in the 1500s. At that time, the site was "given" to be a convent, part of a trend we noticed of the Spanish placing Catholic or government buildings on top of important Inca sites to assimilate the cities under conquest rule and order. We didn't get to see the panoramic view of the outside, but the inside was stunning. It reminded me a bit of the Mezquita in Cordoba, where a cathedral was placed in an old mosque. The mix of architecture was unique. 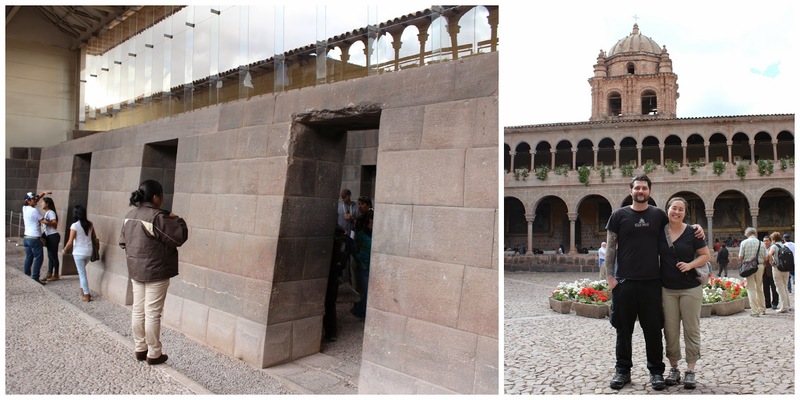 Due to a major earthquake, the Inca foundations and "rooms" withstood the damage and test of time while the colonial architecture has required reconstruction. You can see the Incan foundations in the church. After the Qorikancha, we hit the road, heading away from the higher elevation of Cusco and down into the Sacred Valley. On the way, we stopped by the "Living Museum" of Awana Kancha. When people think about Peru, they often think of the famous camelids including llamas and alpacas. This small roadside "museum" features corrals where you can see a number of camelids that are important to Incan culture. Our guide described to us the differences between llamas and alpacas (mainly you can tell by size and ears) as well as the types of wool. For example, baby alpaca is the first shearing of an alpaca, NOT wool from the baby animal. The texture of the wool changes after the first shearing, which is why baby alpaca is more expensive since you can only get it once. Awana Kancha also exists to help preserve the traditional methods of dyeing wool and weaving by hand. It looks/feels like a small village where these techniques are being handed down even to the very young. There were old women on down to toddlers present, all observing and weaving. It was really cool to see their methods in action! All of the dyes are natural. Seasoned weavers passing on their traditions to younger weavers. There is also a wonderful store there filled with the amazing textiles and works. We didn't buy anything because it was our first day, but if you want to invest in the best quality and authorized/certified good stuff, it's worth checking out! Then we hit the road again. Before heading to our hotel for check-in and dinner, we stopped briefly to see the beautiful panoramic view of part of the Sacred Valley. It was the perfect snapshot to treasure the memories of our first full day in Peru. We definitely enjoyed the beautiful tour of the countryside on our way into the Sacred Valley, inching closer to our trip's climax at Machu Picchu. You had to fly to Cusco? That's incredibly nice that it was on the same time zone as Nashville. I could travel internationally easier if there was less jetlag.